Uttarakhand Public Service Commission (UKPSC), Haridwar has released directions for Uttarakhand PCS Main 2016 examination. All successful candidates of UKPCS 2016 Pre Exam can now apply for Uttarakhand PCS 2016 Main Examination. Candidate can submit their online application form from 10 May to 25 May 2017. UKPSC declared the main examination notification for Uttarakhand PCS Exam 2016. Candidates can apply online for the main examination through the official website www.ukpsc.gov.in. All candidates have to login at UKPSC official site through registration id of Pre Exam Application form. After submission of Uttarakhand PCS Main Exam 2016 fees, candidates have to send or submit the self attested photocopies of fee receipt, documents, experience certificate and reservation certificate (if any) to the commission office till 30th May 2017. 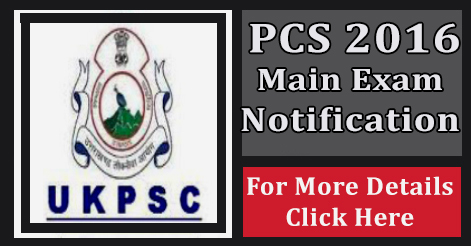 UKPSC PCS Main Exam 2016 will be conducted at two centres – Haldwani & Haridwar. Candidates can choose the centre option at UKPSC official website. Candidates can submit the application fee for Uttarakhand PCS 2016 Main Exam through challan in SBI branches till 25 May 2017. Help us to improve this article/job posting "Uttarakhand PCS Main Exam 2016 Notification". We would be glad if you can comment below and provide your valuable suggestions and feedback. If this page have any wrong information/list or out of context content, then you can report us as well. i want to do gov. job in uttarkhand..so plz let us inform gov job …. when is the uk pcs mains exam scheduled ?